Breeders have generally been careless about preserving records, with many breeds, particularly the popular ones, finding it difficult to properly illustrate their development. It is easy to understand how this state of affairs came about, enthusiasts are naturally reluctant to relinquish valuable memorabilia when that may be all that is left after a lifetime’s involvement, and few people have either the will, or means to house large amounts of memorabilia which is naturally susceptible to deterioration. Fortunately there has been an increasing awareness of these short comings in breed history, and a number of breeds, particularly the numerically small ones with perhaps a single National Club or Association, are now attempting to amass records retrospectively by appointing specialists within their own field capable of undertaking the often enormous task of correlating archive material. Collies have been amongst the most popular breeds almost from the outset of the canine fancy, and it is a sad fact that little of its heritage is available for today’s students. There are of course many reasons for this, not least the problem of space required for physically storing large amounts of memorabilia; however the advent of electronic storage makes such considerations redundant. 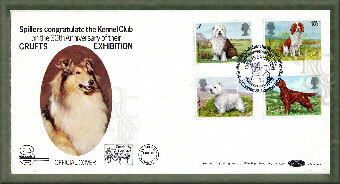 The late Iris Combe’s ‘Tilehouse’ collection of early herding dog archive material is legendary, and her decision to move into residential accommodation in 2005 became the catalyst for Mrs Pat Hutchinson ‘Karibuni’, Iris’ long time friend and confidant, to pressure various Breed Clubs on the subject of an Official Rough Collie Archivist. Included on the Rough Collie Breed Council agenda of November 2005, the subject was referred back to Club level with a recommendation to proceed, and Dareen Bridge ‘Emmsmoor’, who was known to have both an extensive personal collection and interest and in this area, was persuaded to accept the post. 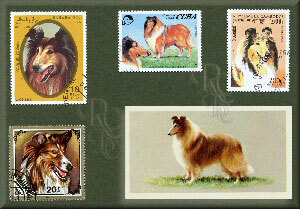 Agreement to support a National Rough Collie Breed Archive reached at the April 2006 meeting. The original material returning to its owner, together with a copy of the electronic copy if so desired. To maintain confidentiality; donated material will remain the property of its original owner and will not be supplied to a third party without their consent. Maintain a master database of all donated items including their storage location, and original owner so that the extent of the entire collection is known. Produce an annual report, to be published here, of collections held, including the name and affix if known of all who have donated material during the previous year. More detailed descriptions of some of the larger collections may also appear here.